I am enjoying The Entrepreneur’s Guide to Customer Development (#tegtcd) and once in a while tweet a gem. One of the authors Patrick Vlaskovits, was kind enough send me a set of diagrams from the book to use in my blog posts. So here is one – Value Path Template. In the book, the authors talk about intermediate MVPs and final MVP. I have not heard of this concept earlier. 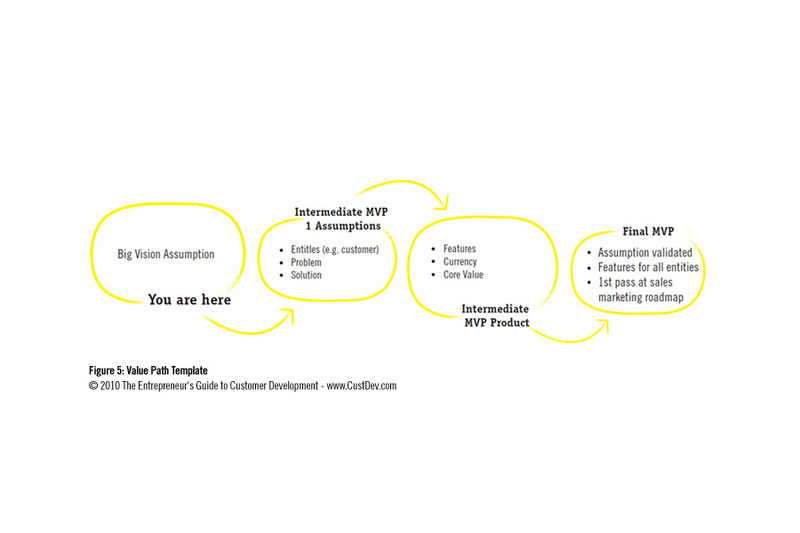 Here is a diagram that shows a value path (increasing value to the entrepreneur as they go through MVPs). I prefer their approach to modelling the business to the Osterwald canvas. Thanks. Any specific reason? Is this simpler? The concept of multiple MVPs each with a specific goal to verify the hypothesis appeals to me. It will be nice to take a mythical product/biz and do a walk through of different approaches for validating the concept.